We've explored for Alaskan amber in several localities in the summer of 2001 and the fall of 2003, however we've only found abundant quantities on the Tundra which unfortunately is only snow free for a few weeks in mid summer, also one must be very vigilant for Polar Bears while trekking across the Arctic! We only surface collected Alaskan amber on river cuts and Caribou trails that have cut through the Tundra and exposed the amber bearing Lignite layers. 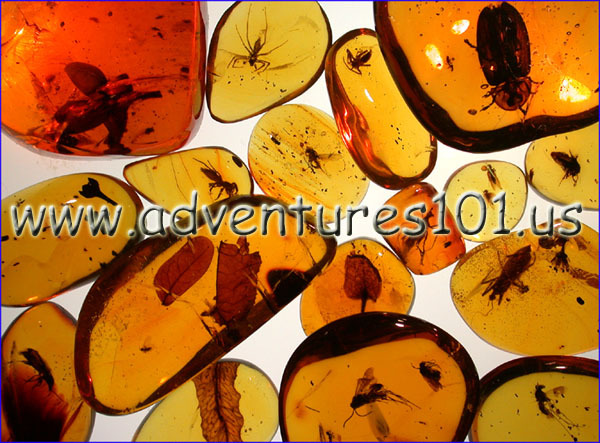 Even though the surface collected amber has been exposed to the elements we did find some beautiful gemstones! Alaskan amber has been dated to approximately 95 million years old. Nearly all of the Alaskan amber research is yet to be published, so we've only included photos of our trips. We have 3 parts to our Alaskan amber pages, the amber specimens, the collectors and trekking - please enjoy!